Clockwise from top: instructions, box, film can with 12 film discs, camera, and package of film. The camera is about the size of a silver dollar. 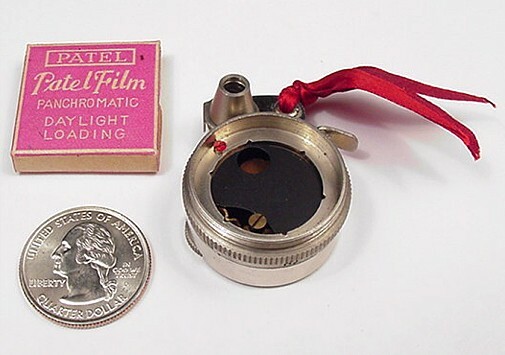 The Petal is a very small, cleverly designed, well made and real cute subminiature camera manufactured in Japan during the late 1940s and early 1950s. 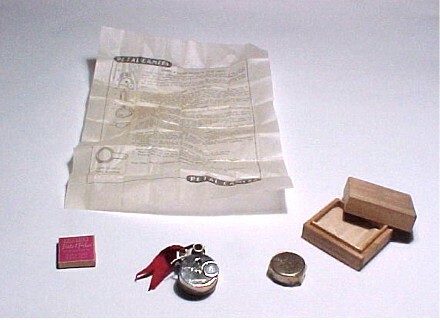 Sakura Seiki Company is just one of the firms thought to have been the manufacturer. To date, I believe no one knows for sure what firm or firms manufactured the Petal cameras. The dial seen on the front of the camera is used to select instantaneous or bulb exposure. To advance the film, the back is rotated until a number engraved around its circumference aligns with a red colored dot. The cylindrical tube mounted on top of the camera is the eye-level optical viewfinder. The Petal was available in two distinct styles. Although layout and features were almost identical, one Petal has a round body while the other has an octagonal shape. This example is known as the round Petal. The round Petal was manufactured and sold prior to the introduction of the octagonal Petal. 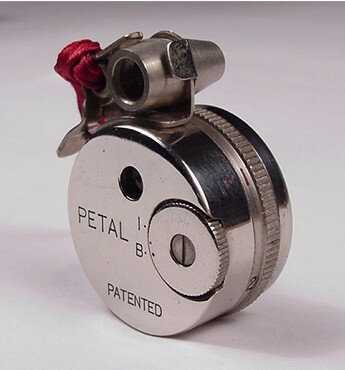 A camera identical to the octagonal Petal is engraved with the name Everax A. 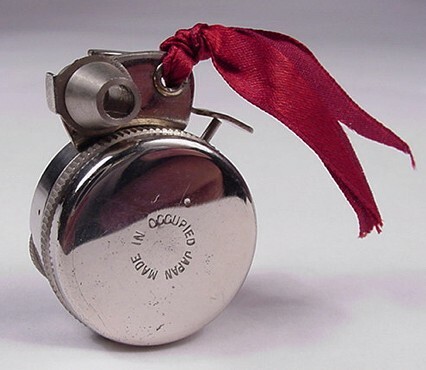 The Everax A may have been introduced around the same date as the round model, and can be considered to be the forerunner of the octagonal Petal. The red ribbon is a great touch. As you can see, Petals were manufactured during Japan's Occupational period. In this photo, on the top right of the camera, notice a curved strip of metal and a straight rod. The curved lever is the shutter release. Film is reloaded by unscrewing and removing the back cover. Look inside the back of the Petal, at the 11:00 position, for a round hole cut into a black plate. The round hole is the Petal's image frame. Petal film was circular as were Petal images. A disc of film was loaded by setting it into the camera back and replacing the cover. Rotating the back aligned the round hole with a fresh section of film. The back could be rotated to six positions yielding six frames per disc of film. The film disc is 25mm in diameter and the image is 6mm in diameter. This box of Petal film calls itself Patel Film. I don't know why. I have also seen boxes of film marked Petal. My can of Petal film is marked Petal, as would be expected. Here is a link to the Petal instruction sheet. This is a large image that can take a few minutes to load. Here is a link to a 1949 advertisement for the newly introduced Petal camera.